The ceremony, part of a national “Pinwheels for Prevention” campaign held every year in April, was hosted by Children’s Advocacy Center (CAC). Chief Probation Officer Jerry Jimenez reminded the crowd that anyone who is in some way certified by the state of Texas is required by law to report any forms of child abuse. He went on to say that those reports are not limited to certified personnel, but may be made by anyone anonymously – family members, neighbors, or friends. Urgent reports of abuse need to be reported to local law enforcement immediately. Each pinwheel symbolized a child of Sutton County who was removed from their homes and placed into sub care throughout the past six years. However, these are only the cases that were documented. The number of cases reported and or investigated is far greater. Sutton County is one of 13 counties including Coke, Concho, Crockett, Irion, Kimble, McCulloch, Menard, Reagan, Runnels, Schleicher, Sterling and Tom Green served by the Tom Green County CAC. The Tom Green County CAC operates as an umbrella organization with programs that focus on the intervention and prevention of child abuse. 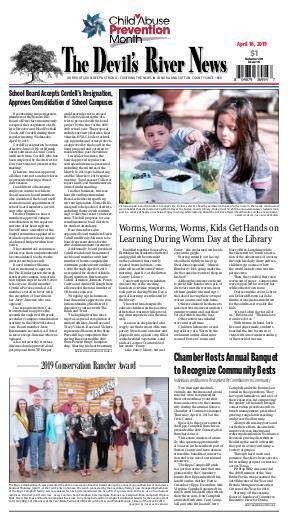 The programs include Hope House, Court Appointed Special Advocates (CASA), Family Enrichment Services (FES), the Child Fatality Review Team (CFRT), and Concho Valley Family Alliance. The placement of the pinwheel is just one of a variety of events taking place throughout the month to help bring about awareness and prevention. Members of the community also wore blue in participation of the special day, marked “Go Blue Day” in Sonora, to help bring awareness about child abuse not only in Sutton County but across the country. Additionally, placemats with reporting numbers and websites provided by the Sutton County Child Welfare Board will be on the tables participating local restaurants throughout the month of April. Blue Sunday, April 28, has also been set aside as an official day of prayer. It is a day when all churches take time during their service to pray for victims of child abuse as well as those who care for them. 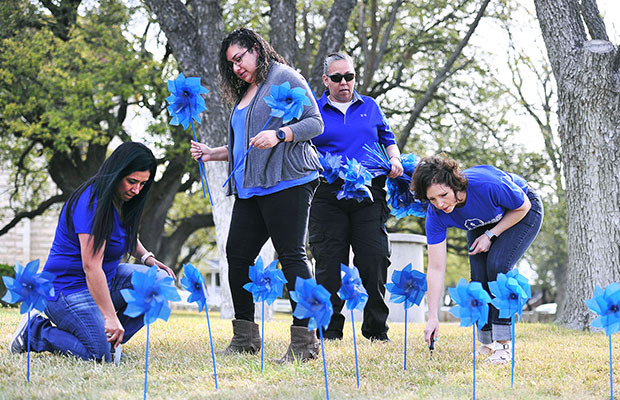 April has been designated Child Abuse Prevention Month in the United States since 1983 and people of all ages in communities like Sonora show their support by wearing blue, the official color of prevention and displaying pinwheels to show their support for children. On March 29, 2018, President Donald Trump issued his own Presidential proclamation to bring further awareness about the importance of keeping children safe from abuse and neglect. In Sutton County, like any other community across Texas and the United States, there are hundreds of cases of child abuse ranging from physical abuse, emotional abuse, sexual abuse, and neglect each year. There is no particular sign of child abuse according to the Texas Department of Family and Protective Services (DFPS). Signs of abuse are exhibited differently in different children. In addition, abuse takes on many different forms because there are many different types of abuse and neglect. Some signs of physical abuse include frequent injuries such as bruises and burns that cannot be adequately explained. Other signs include malnourishment, lack of personal hygiene, dirty clothes, being late or missing school. It takes involvement on the part of everyone in the community to keep children safe. Anyone can report suspected child abuse or neglect. If child abuse is suspected it is important to report it immediately and, in an emergency, call 911. Resources are also available through the Sonora Police Department, Sutton County Sheriff’s Office, Sonora ISD, the courts (adult or juvenile probation), or the Texas Department of Family and Protective Services. For more information on recognizing the signs of abuse, report suspected abuse or find available resources contact 1-800-252-5400 or visit www.txabusehotline.org.